Sprovieri is delighted to present Spacemen/Cavemen, the second exhibition in London of the Brazilian collective Chelpa Ferro. Spacemen/Cavemen is a hybrid work, possessing a "gambiarresca" nature. Two modules, two wooden poles - one emitter of lights and one emitter of sounds - from which discarded objects and material, such as wires, cables, ropes, loudspeakers and lamps, hang and communicate in an almost incomprehensible way; recalling an old invention abandoned for a long time and now floating in the empty space of the gallery. Chelpa Ferro gives these elements a new life, re-signifying them and adding a different meaning to their original functions. Objects, that within consumers’ society have a brief life, here become landscapes of sound and light, where the use of contemporary technologies and resources creates an interactive system, an audio-visual network, which engages the spectator in a wider aesthetic and perceptive experience. Spacemen/Cavemen was created in early 2011 for the exhibition ECO, Station Ermìnio de Moraes, Recife (Brazil) and will be shown in the UK for the first time. Chelpa Ferro is an art group formed in 1995 by the Brazilian artists Barrão, Luiz Zerbini and Sergio Mekler. 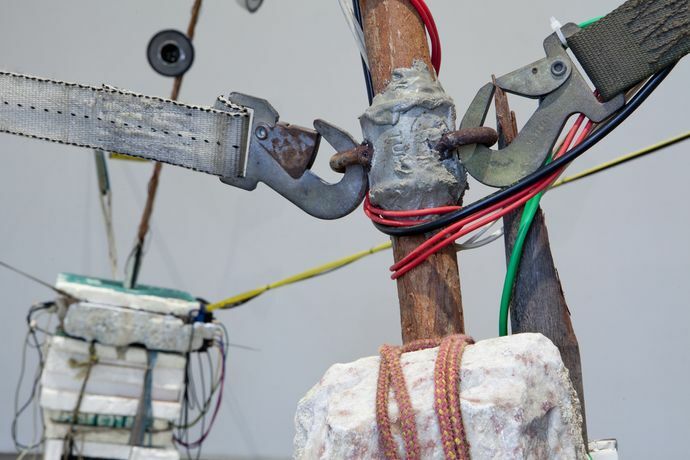 Barrão made a name for himself in the 1980s, by using banal materials, from refrigerator components, to television parts and other fragments of household appliances, to create sculptures with a sense of humor. Luiz Zerbini is one of the most recognized Brazilian painters and Sergio Mekler is one of the most sought after editors of video and cinema in Brazil. Since 1995 Chelpa Ferro has exhibited extensively in galleries and museums, both in Brazil and Internationally; It has also participated in art biennials, São Paulo in 2004 and Venice in 2005 when it represented Brazil. Chelpa Ferro already released four albums and has played live concerts in the UK, United States and Europe. In 2010 the group was awarded the Nam June Paik Award, International Media Art Award of the Arts Foundation of North Rhine, Westphalia, Germany.